Natural quartz, also known as engineered stone, is the fastest-growing countertop material on the market. In tests of countertop materials in a recent article, Consumer Reports rated Natural Quartz the #1 overall performer and called it the best buy for busy kitchens, citing its stain and heat resistant features and low maintenance benefit. Natural quartz countertops are 93% mined quartz crystals, giving them a natural depth and radiance without imperfections, cracks or irregularities. And they’re as practical as they are beautiful. One of the hardest minerals found in nature, the quartz crystals are combined with technologically advanced polymers and pigments, resulting in a luxurious, smooth, high-gloss material that doesn’t require sealing or polishing to maintain its luster. 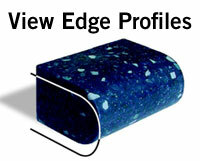 It’s incredibly durable, resists stains, heat and scratches, and is virtually maintenance-free. Granite is a mix of one-half to two-thirds quartz and other minerals (feldspar, mica, and iron ores) along with a binder, solidified naturally under tremendous pressure and heat deep in the earth. Engineered stone is formed synthetically by a patented, hi-tech process that compresses and compacts crushed particles of quartz with polymers. 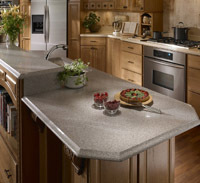 A key difference between natural granite and engineered stone is the array of available colors. The production of stunning, vibrant colors not found in nature is possible through the mixing of pigments in engineered stone. Marvic Corp. features natural quartz from two of the leading brands in the market, Dupont™ Zodiaq® and Silestone®. 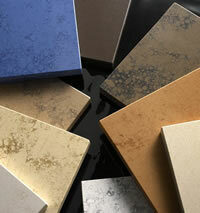 We also carry Caesarstone®, LG Viatera, and Cambria®, among others. Providing a natural depth and radiance without the imperfections common in natural stone. Making it one of nature’s strongest materials with a hardness of 7 on a scale of 10 (only diamonds rate a 10). With the toughness and durability to resist both heat and scratches. Combines the unusual light play and depth of quartz crystals with exceptional clarity in a broad range of radiant colors that go beyond the palette of unimproved stone. Has a smooth, non-porous surface to resist even the toughest stains and retain its lustrous gloss and sleek feel without the need for sealants or waxes. Is very easy to maintain using only a damp sponge or cloth and, if necessary, a small amount of non-bleach, non-abrasive cleanser for routine cleaning. Carries a ten-year limited warranty from DuPont™ backed by a network of fast-response DuPont™ Authorized Service Agents.